Hard work = results, right? Well , yes but hard work + smart work + the right supplements = GREAT results. No nonsense, honest advice and direction. In the gym and in your supplement choices. I have personally used and continue to use every product listed on my page for one reason and one reason only, results. A controlled glucose level study with Karbolyn® - vs. - glucose. BioCeutical Research & Development Laboratory, December 2009. 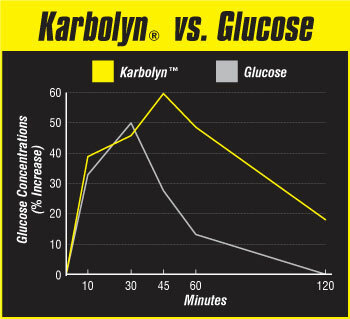 Results: Karbolyn® was absorbed 18.21% quicker than glucose and had a sustained energy response of nearly 1 hour over glucose. Glucose peaked at 30 minutes but dropped dramatically, and was spent before 120 minutes. You might hear others making claims that sound like Karbolyn®. But remember this fact: There is only ONE Karbolyn... and we've got it! Have you ever experienced "hitting the wall" while training or participating in your favorite sport? When your body runs out of fuel too soon, it literally goes into 'survival mode,' killing your performance when it counts the most. One moment you are performing at your peak, and the next minute you can hardly walk or move. It's an athlete's worst nightmare! So forget about dextrose, waxy maize starch, spaghetti or any other carbohydrate source you might use to try and promote your performance, endurance and recovery. Get on Karbolyn®, and get busy dominating your competition! From Bodybuilders and strength athletes... to cyclists, runners and CrossFit enthusiasts, rarely has one product been so useful for so many! Alpha Amino offers a sugar free alternative to traditional sports drinks, and is available in a variety of outstanding flavors such as Lemon Lime, Fruit Punch and Blue Raspberry. It’s easy to find a flavor you’ll love but hard to choose a favorite. On the field, in the gym, or throughout the daily grind, operate at peak levels to tackle any obstacle head on.